This fat bottom bag is perfect for so many uses! Take it to the beach, pack up children’s toys, take it to the market, store those projects you have going on! 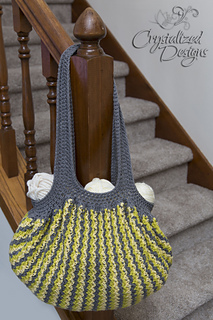 This bag is also perfect for stash busting! Each row takes a little amount of yarn. Adding many colors gives you a one-of-a-kind bag! All patterns are written in English and use standard American English crochet terms. Permission to sell finished products but not the pattern itself. All patterns have been tested by qualified crochet artists but if you believe there may be an error, please contact me. I fully support all my patterns and will offer any additional assistance so you may complete the pattern successfully. Please refer to difficulty level within the listings. I would love to see any pictures!! Feel free to post on my wall!